Bed and breakfast in Kirkby Lonsdale. Kirkby Lonsdale is a historic market town between the Yorkshire Dales and the Lake District. Set in a superb location of natural beauty, the town is a great tourist attraction, famous for the medieval Devil's Bridge, a scheduled ancient monument, and Ruskin's View over the River Lune, a famous local attraction. Mentioned in the Doomsday Book of 1086, Kirkby Lonsdale holds a 13th century market charter, and possesses many 17th and 18th century buildings. There are many riverside and country walks in the area, and historic buildings to see in the town itself, including the 11th century Norman parish church. Kirkby Lonsdale is only 6 miles from the M6 (Exit 36) going east, and has a by-pass which takes away through traffic. It is a perfect half-way stopping place between London and Scotland. Also see Kirkby Lonsdale & Kirkby Lonsdale attractions. If you are in the right town but cannot find the accommodation you want on this page, you might consider Kirkby Lonsdale hotels & self catering accommodation in Kirkby Lonsdale. In the heart of the beautiful market town of Kirkby Lonsdale overlooking St Mary's Church, this 17th century inn fuses both traditional and contemporary elements. Relax amid the roaring log fires of the traditional bar; unwind in the inviting lounge; and treat yourself in the contemporary restaurant, where high quality meals are created from local fresh ingredients. Double and twin rooms are available, each fresh and clean and furnished with a pillow top bed and fluffy duvets. Set amid beautiful landscape, you can walk within minutes to Devil's Bridge, Ruskin's View (famously painted by Turner), as well as the stunning walking region of the Lune Valley. This is a 5 star AA rated guest house property and a rosette award for the restaurant All rooms have LCD TVs, free Wi-Fi and home-made biscuits. The en suite bathrooms feature Bath House toiletries. Located in the delightful village of Barbon, about 3 miles north of Kirkby Lonsdale. Between the Lake District and the Yorkshire Dales, this former 17th-century coaching inn is rich in original character and traditional charm, offering good food, real ales and log fires. Nestled in the Lune valley, The Barbon Inn has a superb location, with the stunning scenery of the Lake District to the West and the breathtaking natural beauty of the Yorkshire Dales to the East. The M6 motorway is a scenic 10-minute drive away. Quiet and peaceful, the inns charming location makes it a great base for walkers and keen golfers.Enjoy water sports in and around the nearby lakes or try mountain biking. In the beautiful market town of Kirkby Lonsdale, this renovated 17th-century cottage offers 3 homely, small en suite rooms. The cosy lounge with log-burning stove can be made available. A cooked English breakfast is included in the room rate. There are 3 car parking spaces for guests (150 yards/140 metres from Blue Pig). The cottage is conveniently located just off the A65, only a few miles from the M6 motorway. The peaceful, convenient location makes the Blue Pig ideal for exploring the town and countryside. Location: in Kirkby Lonsdale. Set in a picturesque market town, Plato's offers boutique hotel accommodation, a stylish bar and free Wi-Fi. There is good access to the M6 motorway. Awarded 5 stars by the AA, Plato's has charming rooms with luxurious beds, flat-screen TVs and antique furniture. A full English breakfast is provided. The superb restaurant serves an imaginative menu in cosy surroundings. Near the Lake District and the Yorkshire Dales, Kirkby Lonsdale has many shops, boutiques and popular walking routes. Hotel near Kirkby Lonsdale. Since acquiring the New Inn our aim has been to restore and develop it into one of the finest inns in the Dales. Bed and breakfast near Kirkby Lonsdale. A Wonderful Old (circa 1610) 17th Century Grade 2 Listed, Guest House. 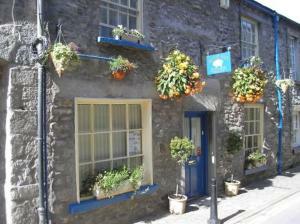 Situated Centrally in the Picturesque Yorkshire Dales Village of Ingleton. For bed and breakfast accommodation in other areas nearby see bed and breakfast in Settle & bed and breakfast in Skipton.